If you ask people of Capricorn Research’s generation, what was the scariest film they’ve seen, its a fair bet that most of them will say The Exorcist. The Exorcist was a 1973 horror film that dealt with the demonic possession of a 12-year-old girl and her mother’s desperate attempts to win back her child through an exorcism conducted by two priests. The film earned 10 Academy Award nominations, winning two. It became one of the highest-grossing films of all time, grossing over $441 million worldwide. It is also the first horror film to be nominated for Best Picture. The film has had a significant influence on popular culture. It was named the scariest film of all time by Entertainment Weekly. Capricorn Research can vouch for this, in fact the friend that I went to see it with could never listen to Tubular Bells ( the theme music ) again without getting the shakes. In fact looking at the chart for the film’s release date can conjure that effect on its own. 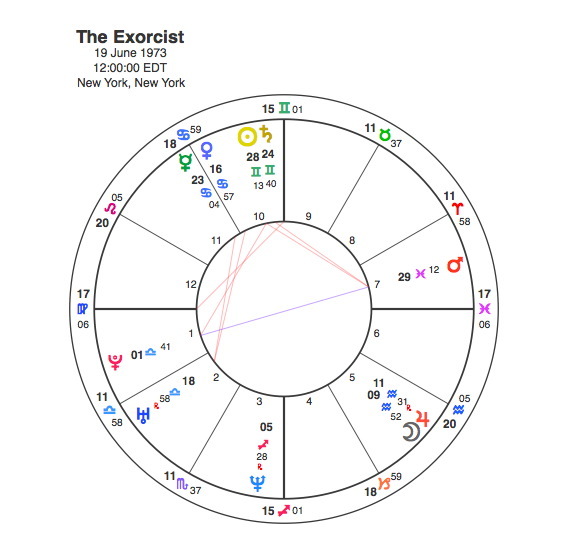 Unfortunately we have no time for this chart but any astrologer looking to find an appropriate release date for a serious horror film would not be able to do better than a Mars / Pluto / Saturn T Square. The fact that the Sun is also at the apex of this pattern adds considerable power to the dark themes in the film. It becomes clear during the film that the daughter Regan is possessed by a demon called Pazuzu and it seems that she is in some way responsible for the death of her mother’s film director. The two priests Karras and Merrin attempt to exorcise Pazuzu from Regan but the demon taunts them, especially Karras for his weak faith and guilt over his mother’s death. Their first attempt fails and Karras is dismissed after a break, as Merrin knows he is not mentally fit for a second attempt. Despite this, Karras returns to the room where Regan is now free from her binds and Merrin lies dead. In a fit of rage Karras assaults Regan and orders the demon to take him instead. Pazuzu obeys and Karras throws himself from the window. He then dies of his injuries. Merrin is played by Max Von Sydow. Von Sydow has played a number of very intense characters in films including Knight Antonius Block in Ingmar Bergman’s The Seventh Seal in which he plays chess with Death, Jesus in The Greatest Story Ever Told(1965), Joubert the assassin in Three Days of the Condor, Ming the Merciless in Flash Gordon and the villain Ernst Stavro Blofeld in the James Bond film Never Say Never Again. 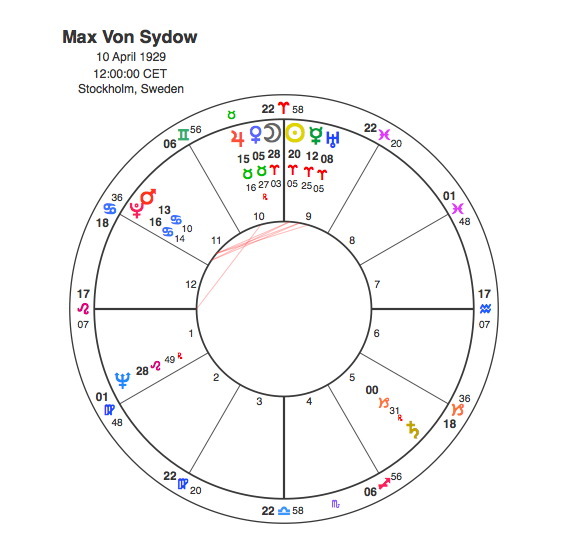 Von Sydow’s Aries Sun is square to a Mars / Pluto conjunction in Cancer, a fitting aspect for someone who dies whilst attempting to perform an exorcism on a child. Karras is played by Jason Miller. 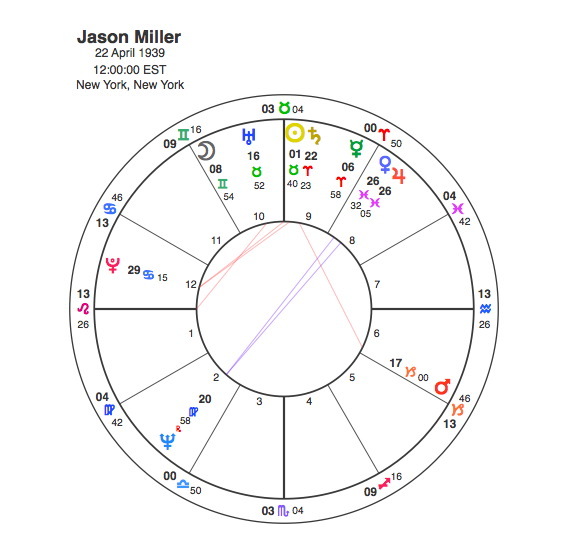 Miller was not such a widely renowned actor as Von Sydow and in some ways his chart is more reflective of his role in the Exorcist. Miller’s Sun is also square to Pluto. The Sun is conjunct Saturn which is itself square to Mars. Karras’ own sacrifice is reflected by the Venus / Jupiter conjunction opposite Neptune. Now of course when you go to see something like the Exorcist and get scared to death, the one consolation you have is that its only a film. But there are some people who actually do this sort of work as their day job. Gabrielle Amorth’s favorite film is The Exorcist. He thinks that it is substantially correct and based on a true story, although the special effects are exaggerated. He should know because as a Roman Catholic priest he claims to have performed 160,000 exorcisms in the course of his ministry. Fortunately we do have a birth time for Amorth and it is one that places his Sun squarely in the 8th house of death and personal transformation. The Sun in the 8th house is exactly opposite Saturn in the 8th sign, Scorpio. 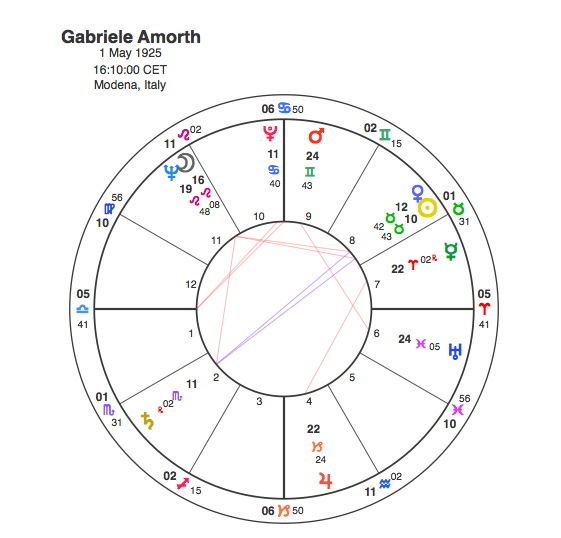 Gabriele Amorth’s chart seems to say that he had a fair share of his own demons. This opposition focuses by T Square onto an apex Moon / Neptune conjunction in Leo which enabled him to gain spiritual absolution and release and bring these demonic and possessed souls to the light. Its particularly interesting that Amorth’s turning point was when he became an exorcist in June 1986 with Pluto making an opposition to his Sun by transit. Amorth also has Mercury in Aries in exact square to Jupiter, a placing that gives a strong sense of certainty about one’s own convictions together with the desire to broadcast them to others in an overbearing manner. He is quoted as saying that yoga is satanic because it leads to practice of Hinduism and “all eastern religions are based on a false belief in reincarnation” and “practising yoga is satanic, it leads to evil just like reading Harry Potter”. Capricorn Research’s day job is as a therapist / healer. Most authentic healers will admit that they are basically healing and working on themselves and their clients just join in with the energy circle. If this is not happening, it doesn’t actually work. The lives we lead and the things we do are simply an expression of our own themes. But sometimes its difficult for us to acknowledge that we are really just projecting our own stuff so we have to attribute our dark stuff onto others. Performing exorcisms on other people is a good way of working through our own demons. But its very difficult for someone with a Taurus / Scorpio opposition to accept. People with oppositions will frequently externalise their own conflicts and see them as being out there in the world rather than in their own heads. A Sun Taurus has a very strong, consistent, stable and even fixed sense of themselves and there is little room for recognition of Scorpionic undercurrents. They generally have an overdeveloped sense of what is right and what is wrong. Far simpler to project those dark things onto other people. But if this projection creates a scenario that helps bring a few other tortured souls back then its all good. Its just a bit boring when people get so holier than though about it and start slagging of Harry Potter. And despite it all, I still love Tubular Bells. Incredible post. I was always fascinated by this unhealthy area of repressed and psychotic material aka demons and possesions. When i work as the therapist i sometimes see exttreme forms of catharsis in clients that look a bit like letting go/integrating demonic parts. Luckily i did not see someone’s neck turning around. Great article. it would be interesting also to track the peculiar impact that the Exorcist had on the public, and possibly look for Moon/Neptune aspects. I believe that fainting, fits of hysteria, and paralysing fear accompanied the popularity of this film, which I agree is still one of the best made, and scariest films ever because it has more depth, and character development than many horror films. Pazuzu may still be alive as a troll on the internet these days.